Aqua Foundation is a Non-Governmental Organization which was founded in year 1998. The founding and existing members of the organization are committed to bring positive change in society and are contributing selflessly to various environmental and humanitarian causes. They have been organizing the international conference ‘World Aqua Congress’ every year since 2007. During the conference, the ‘Aqua Excellence Awards’ are given to promote, encourage and recognize innovations and contributions in the field of environment and humanity. The 11th World Aqua Congress was held on November 9th, 2017 in New Delhi. 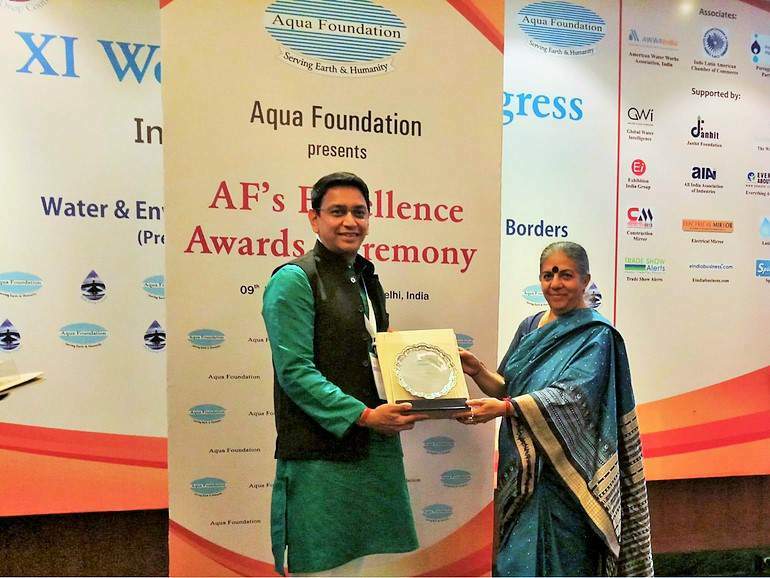 In the presence of eminent personalities, we have been awarded the Aqua Foundation’s Excellence Award 2017 in the category “Outstanding Contribution towards Cause of Sustainability (Private Sector)”. This award is given to organizations promoting sustainability and helping to address environmental issues. We were identified and awarded for having contributed to the cause of sustainability for the last 18 years in India. We are very proud of this moment and would like to share our happiness with you.